Ultrasound equipment has developed rapidly over the past 30 years and is now used routinely for assessment of arterial stenosis, venous incompetence and venous thrombosis. This article provides practical details of the main lower-limb vascular examinations currently undertaken in vascular laboratories. It is intended to give an insight into the strengths and limitations of the techniques for those involved in tissue viability and ulcer management. For those interested in obtaining more detail, a comprehensive review of the developments has been carried out by Meire and Farrant  . A general introduction to the impact of ultrasonic scanning on vascular assessment is given by Androulakis et al  , and Polak  gives practical detail on performing the basic examinations. Ultrasound images are obtained by holding a probe on the skin surface. An ultrasonic scanner usually has a range of probes with different characteristics, and for lower-limb vascular scanning a linear array probe is normally used. This produces a rectangular image which is displayed with the skin surface at the top, the vertical axis showing depth into the body and the horizontal axis showing position along the probe. When imaging blood vessels, the probe can either be placed along the vessel to produce a longitudinal scan (Figure1), or across the vessel to produce a transverse scan (Figure2). To produce the images, the probe emits short pulses of ultra-sound, and these travel into the body from the probe. Within the soft tissues or at boundaries between them, a small proportion of the ultrasound is scattered or reflected and arrives back at the probe as an echo (Figure 3). The speed of ultrasound in the body is constant (1540 m/s), so the depth of any scatterer or reflector can be found from the time delay from emitting the pulse to receiving the echo. The main pulse continues deeper into the body to be scattered or reflected from deeper structures. 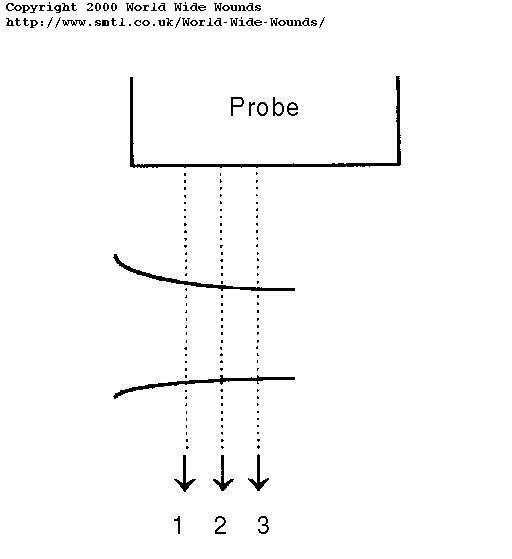 When the echoes from one pulse have died down, the next pulse is emitted from a slightly different position along the probe (Figure 4). In this way, it is possible to build up an image of a plane in the body, with depth into the body as the vertical axis and position along the probe as the horizontal axis. The probe determines the frequency of the ultrasound within the pulses. Frequencies between 3 and 7 MHz are generally used for peripheral vascular imaging. Higher frequencies give better resolution and more detailed images, but the higher frequency sound loses energy more quickly as it travels through the body so the depth of penetration is less. The operator usually uses as high a frequency as possible. Ultrasound of these frequencies does not travel through air, so a layer of water-based coupling medium is used between probe and skin. Figure 1: Longitudinal scan of the femoral bifurcation, where the common femoral artery (CFA) divides into the superficial femoral artery (SFA) and the profunda femoris artery (PFA). The skin surface is at the top of the image and the markers on the right show depth in centimetres. Arterial blood flow is from left to right. 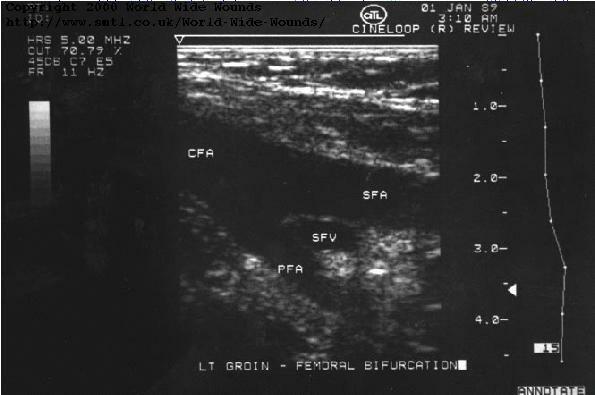 Figure 2: Transverse scan of the femoral bifurcation showing the circular lumen of the superficial femoral artery (SFA) and the profunda femoris artery (P). The common femoral vein (CFV) is also seen. Figure 3: Creating one line of an ultrasonic image. (a) An ultrasonic pulse is emitted from the probe and travels into the body. (b) At a boundary, some of the energy returns to the probe while the majority continues to travel into the body, to be returned off deeper structures (c). The returning echoes are used to build up each line of the image. The image is called a grey-scale image because different shades of grey are used to indicate the strength of the received echoes, stronger signals being represented more brightly. Echoes from blood are of lower strength than those from the surrounding tissues, so vessels normally appear dark. With a good quality scanner, different layers can be seen in the vessel wall, and in particular the intimal layer lining the inside of the vessel can often be seen (Figure 5). The early commercial ultrasonic scanners could only display echoes as white and there was no brightness variation. These scanners were good at displaying outlines such as the fetal head but were limited when examining the internal structure of organs. Commercial grey-scale scanners were introduced around 1974 and this was an important stage in the development of equipment suitable for vascular work. Another significant development was the improvement in commercial real-time scanners in the late 1970s. 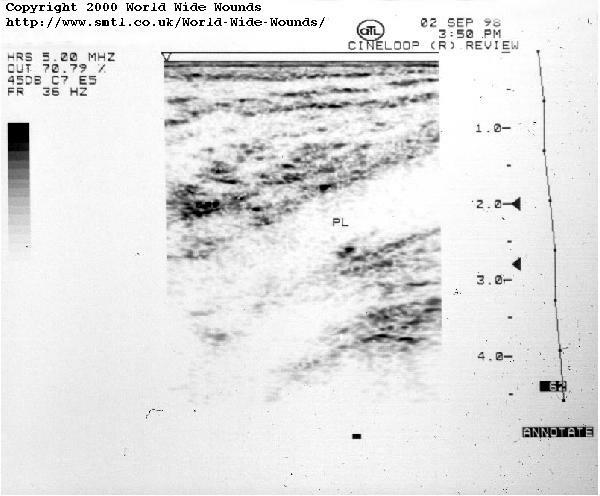 The operators of the earliest scanners built up an image by sweeping a probe by hand over the skin surface. Modern scanners have many individual transmitters and receivers in a single probe, and the image is built up by electronically switching between different transmitters and receivers. More than 30 frames can now be acquired every second, and a real-time image is displayed on the screen, changing apparently instantaneously as the probe is moved. This assists the operator in tracking vessels, and also enables arterial pulsation to be identified. In this article, all the images are single frozen frames, and it is not possible to convey the immediate nature of the real-time image. Duplex scanners display real-time grey-scale images which allow the operator to display the speed of blood flowing in a selected part of the image. 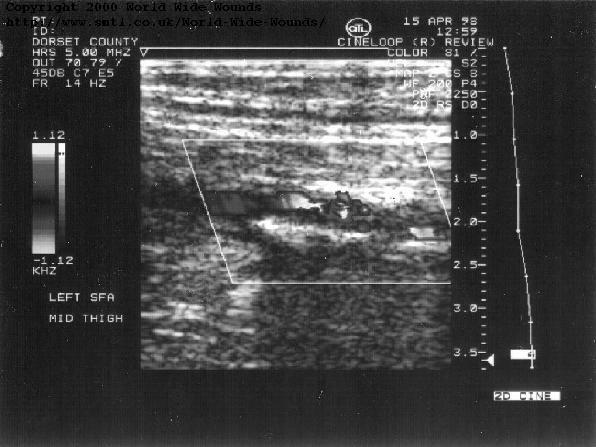 Figure 5 shows a duplex scan of a superficial femoral artery in the upper thigh. The operator has placed a 'gate' in the image of the artery, and the blood velocity waveform is displayed. In the common and superficial femoral arteries, the waveform normally has a forward component followed by a reverse component and a second smaller forward component. This is called a triphasic waveform because of the three phases. More distally in the superficial femoral artery, the second forward component may be absent, giving a biphasic waveform with two phases. The duplex scanner detects the moving blood by using the Doppler effect. Ultrasonic echoes returning to the probe from stationary structures come back with the same frequency. However, if the target is moving towards or away from the probe, the echoes return with a higher or lower frequency. The scanner detects any change in frequency, and can calculate the actual speed of the target provided the angle between the direction of the ultrasonic beam and the direction of movement is known. The operator therefore aligns a marker along the direction of flow in the blood vessel and positions a cursor at the height of the peak systolic blood velocity. The scanner then calculates the speed of the blood (Figure 5). The frequency shift caused by the Doppler effect depends on the frequency of the transmitted ultrasound and the speed of the blood. It happens that the frequency shift is normally in the audio range, so most duplex scanners send the signal to a pair of audio speakers, and this enables the operator to hear the signal in addition to seeing the display. 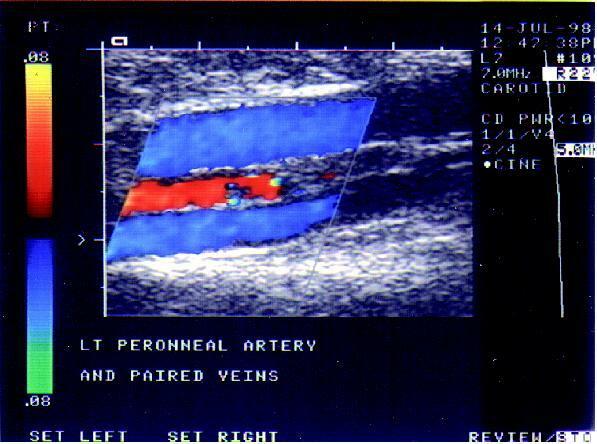 Figure 5: Duplex scan of a superficial femoral artery. The operator has placed a gate in the image of the vessel lumen, and the triphasic blood velocity waveform is obtained. The peak systolic velocity (0.71 m/s) is measured using the cursor. Note the intima of the artery, marked with arrows on the near and far walls. Colour Doppler scanners detect and display moving structures by superimposing colour onto the grey-scale image. The operator positions a box on the image, and colour is superimposed wherever the scanner detects a moving structure, usually blood. Figure 6 shows a colour Doppler image of the popliteal artery behind the knee. The colour fills the lumen of the vessel, showing that the blood is moving right up to the vessel wall.The hue of the colour shows the direction and magnitude of the blood velocity. In this image, red and yellow indicate flow away from the probe, with dark red representing low velocities and orange and yellow indicating higher velocities. Flow towards the probe is indicated in blue and green, with green indicating higher velocities. The hue can therefore be used to identify sites where the artery becomes narrower and the blood has to move faster to achieve the same volume flow rate. When the blood velocity exceeds the limit of the colour scale, aliasing occurs. The equipment interprets high velocity in one direction as lower velocity in the other direction, and there is a sudden transition from yellow to green or vice versa (Figure 4). This can be useful for identifying the raised velocities associated with significant narrowing of the arteries. Colour Doppler can also be used to display venous blood flow. The blood moves more slowly in the veins so different settings are used. Most scanners come with a menu of recommended settings for different applications, including peripheral arterial and peripheral venous studies. 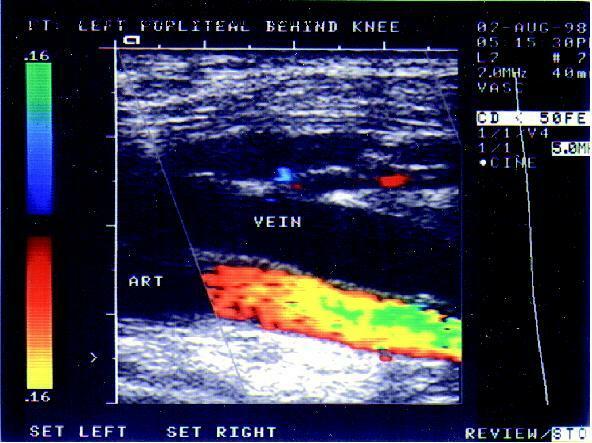 Figure 6: Colour Doppler image of a popliteal artery. Arterial blood flows from left to right, away from the probe. The colour indicates the speed and direction of the flow. Note the sharp transition from yellow to green towards the right of the image. This is caused by aliasing as the blood velocity exceeds the scale maximum. Blood is normally supplied to the leg through a single main artery (Figure 7). This has different names in different parts of the leg: common and external iliac arteries in the lower abdomen, common and superficial femoral arteries in the thigh, and popliteal artery behind the knee. 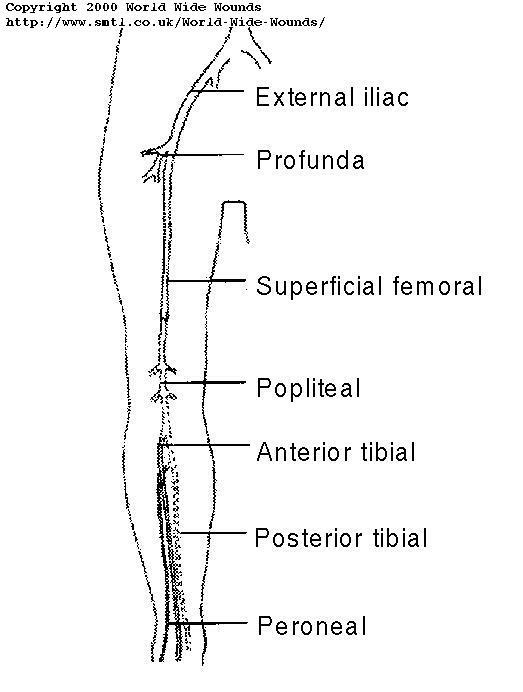 Below the knee it branches into the smaller posterior tibial, peroneal and anterior tibial arteries. The reason for scanning these arteries is to locate and assess any narrowing (stenosis) or blockage (occlusion). A general review of the role of ultrasonic scanning in the diagnosis of peripheral arterial disease is given by Polak  . 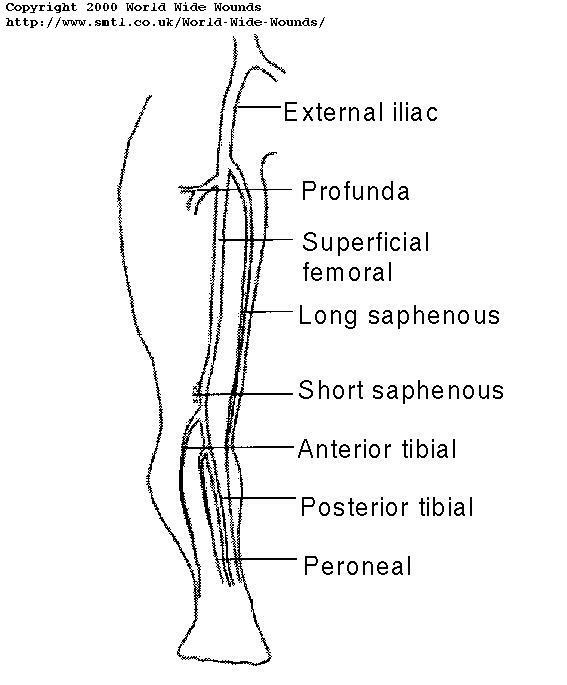 Figure 7: The main arteries of the lower limb. Patients are normally referred with claudication (pain on walking, particularly uphill) or with ulcers around the ankle and on clinical examination the ankle pulses are likely to be weak or absent. The main options for treatment are either (a) to encourage the patient to exercise and develop collateral vessels to take blood around the site of disease, (b) to perform angioplasty which involves passing a balloon catheter down the artery and inflating it at the sites of narrowing or blockage to dilate the vessel, or (c) to surgically insert an graft to bypass the diseased portion of the vessel  . The clinical information required is therefore the site and severity of any narrowing of the vessel and the site and length of any blockages of the main vessels. In the presence of multiple stenoses, the study can indicate which are causing the more critical restrictions to blood flow. The referring clinician can use this information to decide whether intervention is appropriate, and, if so, whether to proceed to angioplasty or to insert a graft  . The examination starts with the patient lying supine with the head slightly raised. Coupling gel is put on the thigh from groin to knee over the path of the artery. The probe is placed on the skin in the groin and the common femoral artery identified using the colour Doppler display. The scanner is switched to duplex mode, and the blood velocity waveform in the common femoral artery is obtained. The waveform is usually biphasic or triphasic. The peak systolic blood velocity normally lies between 90 and 140 cm/s (ref 3, p 260). Values significantly above this may indicate local stenosis, while values below can indicate low flow caused by proximal or distal occlusion. The presence of any plaque intruding into the lumen is noted, and the degree of stenosis is estimated. (Figure 8) shows a scan of a femoral artery with a small protruding plaque causing about 20% stenosis. Figure 8: A plaque protruding into the lumen of the common femoral artery. The plaque (PL) is small and is causing about 20% stenosis. The shape of the waveform is important because a monophasic waveform can indicate proximal disease in the iliac vessels. The biphasic or triphasic waveform occurs because the main blood vessels in the leg are elastic and are dilated by the increased pressure during systole. This creates a reservoir of blood which empties during diastole. The volume of blood in the reservoir is more than enough to supply the limb, and the excess flows back up the vessel into the abdominal aorta creating the reverse flow component (Figure 9). An abnormal monophasic waveform without the reverse component occurs when the volume in the reservoir is insufficient and extra flow is required during diastole. This is usually because an iliac stenosis or occlusion reduces the blood available to fill the reservoir during systole, but may also occur when there is a large flow to the limb caused by exercise or gross infection. Proximal disease can also be indicated by turbulence in the common femoral artery. Turbulence is created in eddies distal to a tight stenosis, and the eddies then travel downstream with the blood flow. They can be detected as spikes in the blood velocity waveform (Figure 10), usually on the downslope at the end of systole. The turbulence is more likely to be created during peak systole when the local blood velocity is highest, but appears later than this distally because the systolic pressure pulse travels faster than the eddying blood. The delay between peak systole and the appearance of the turbulence in the common femoral artery can give an indication of the site of the proximal iliac stenosis. Jager et al  have described the shape of the waveform in the lower-limb arteries and the changes associated with different degrees of stenosis. Figure 9: Schematic generation of a biphasic waveform. During systole (a), the heart pumps blood into the peripheral vessel and the branches. The peripheral vessel expands. During diastole (b), the vessel contracts. There is more than enough blood in the vessel to supply the periphery, and the excess flows backwards into the more proximal branches. A biphasic waveform is obtained at the point marked with an asterisk. Figure 10: Turbulence in the common femoral artery. The blood velocity waveform contains spikes (marked I) just after peak systole. These represent turbulence generated from a proximal tight stenosis. The probe is then moved along the artery until the origin of the profunda femoris artery is identified using the colour Doppler display. This is usually just beyond the skin crease in the groin. The blood velocity waveform at the origin is obtained, the waveform shape noted and the presence of any stenosis recorded. The position of the origin can be marked on the skin surface using a water-soluble crayon. The superficial femoral artery is examined along its length using the colour Doppler display. The colour scale is set so that the normal blood velocity in the vessel is just below the top of the scale. Any increase in velocity caused by a stenosis will therefore go above the scale, causing aliasing and its characteristic display. Whenever a stenosis is suspected, the blood velocity waveform is obtained just proximally and the peak systolic velocity measured. The duplex gate is then moved through the stenosis, monitoring the waveform until the maximum velocity is obtained. A significant stenosis is normally taken to be one that more than doubles the blood velocity . The site of any significant stenosis is marked on the skin surface and the distance from the vessel origin and the increase in velocity recorded. Figure 11 shows a superficial femoral artery stenosis. The plaque causing the stenosis can be seen and the colour Doppler shows aliasing. The peak systolic blood velocity, (Figure 12), increases from 0.26 proximally to 3.90 m/s through the stenosis, an increase by a factor of 15 indicating a very tight stenosis. Occlusion is characterized by a gradual fall in blood velocity along the vessel as blood is taken away by collateral vessels. The waveform usually becomes monophasic close to the occlusion, and at the blockage the colour Doppler display shows absence of flow. When flow is low, it can be difficult to determine the precise point at which flow ceases, and the operator must ensure that any flow shown is within the vessel rather than along a nearby collateral. When an occlusion is detected, the operator marks the start on the skin, and then continues to track down the artery using the colour Doppler display until flow is again identified in the lumen. The distal end of the occlusion is marked and the length measured. As the scan progresses down the leg, the artery becomes deeper and can be difficult to image, particularly in larger patients. 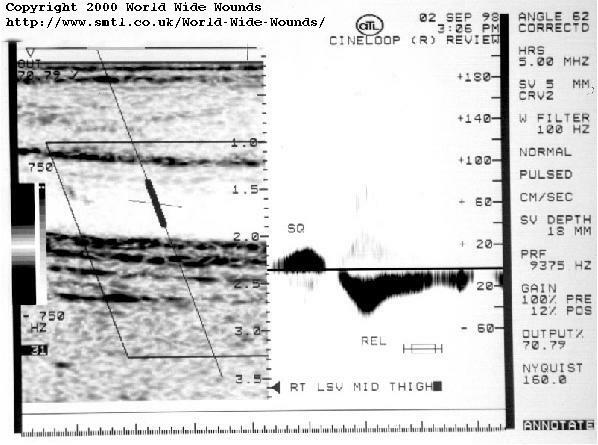 The vessel is scanned as far down the leg as possible and the blood velocity waveform recorded from this distal site. The position is marked on the skin. To complete the examination of the lower-limb arteries, the patient turns onto their side or front and the popliteal artery is scanned behind the knee. 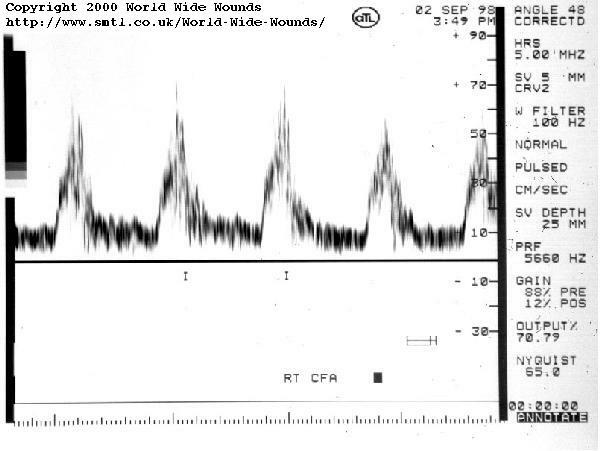 Waveform shape, peak systolic velocity and the presence of plaque are all recorded. Where the distal superficial femoral artery is deep, there may be a portion of the vessel that is not accessible from the front or the back. This can limit the accuracy of the scan, especially in the adductor canal just above the knee. Problems can also be caused by a vessel with multiple calcified plaques, which block the ultrasound preventing a clear view of the vessel. However, an experienced operator can use other clues such as the presence of turbulence and changes in waveform shape to determine the presence of significant disease. Where there is an occlusion or tight stenosis, collateral vessels re-entering distally can supply blood at high velocity which can mimic a stenosis. The collateral vessel can sometimes be identified by the presence of colour outside the main lumen. Figure 11: A superficial femoral artery stenosis. The colour image shows aliasing, a sharp transition from maximum speed away from the probe (light blue) to maximum towards (yellow). The lumen is narrower at the stenosis and the brighter echoes in the near wall show the presence of plaque, which is causing shadowing to the right of the image. Figure 12: Velocity waveform through a stenosis. The peak blood velocity through this superficial femoral artery stenosis is greater than 3.9 m/s, compared with 0.26 m/s just proximal to the stenosis. This increase in velocity shows a very tight stenosis. A full lower-limb scan may be time-consuming since the whole length of the artery must be scanned carefully. About 30 minutes is needed for a full unilateral study and 50 for a bilateral study. Other tests are sometimes performed at the same time, and it is common to include a measurement of the ankle/brachial pressure index (ABPI) which extends the study by about 10 minutes    . The ABPI (ratio of ankle arterial systolic blood pressure to brachial pressure) is normally greater than 1.0, and ratios lower than 0.90 at rest are usually considered abnormal and indicative of lower-limb arterial disease . However, an artifactually low reading may be obtained if the ankle signals are weak and of low amplitude. Headphones can be useful to ensure that the signal is heard as soon as it returns as the cuff pressure is reduced. Artifactually high readings may also be obtained if the leg arteries are calcified and cannot be compressed. This happens particularly in diabetic patients. In these cases, the arterial waveform at the ankle can help to exclude disease since a biphasic waveform, with both forward and reverse components, indicates absence of severe flow-limiting disease. For all these pressure measurements, it is important that the cuff is the correct size  . Ideally, the ratio of cuff width to limb circumference should be around 0.4, and it is good practice to have a large cuff available for large or swollen limbs. Reducing errors is especially important if ABPI is the only measurement being made and the patient is not proceeding to duplex scan. If iliac disease is suspected, either from clinical examination or from a monophasic common femoral waveform, the aorto-iliac segment can be scanned  . A 3.5 MHz probe is usually used to give better penetration and a wider field of view. Access to the vessels can be difficult if overlying bowel and bowel gas block the ultrasound. Some centres give an enema before scanning this region, but in thin patients a satisfactory examination is often possible without bowel preparation. The operator is again looking for narrowing or blockage of the artery and the same criteria are used. If distal disease is suspected, some of the small arteries below the knee can be examined. The posterior tibial artery is usually accessible just above the ankle from the medial aspect, and can be traced up the leg as it gets deeper. The artery runs parallel to a pair of veins (Figure 13) and this can aid identification. The operator is again looking for evidence of stenosis or occlusion, but these vessels are small and close to the limit of resolution of all but the most modern scanners, and absence of detected flow may indicate lack of sensitivity of the equipment rather than occlusion. Figure 13: Peroneal artery and paired veins. The arterial flow, shown in red, is from left to right with a component towards the probe. The venous flow, shown in blue, is in the opposite direction. The anterior and posterior tibial arteries also lie between paired veins. The lower-limb venous anatomy is complex and variable, but the veins can be divided into deep veins, superficial veins and perforators. The purpose of the veins is to return blood back to the heart, and when standing this has to be done against gravity. To assist the venous return, there is a pump operated by the calf muscles. As these contract, they squeeze blood out of the calf and up the leg. One-way valves in the veins prevent the blood from falling back as the muscles relax. The muscle pump is more effective in the deep veins, so the venous anatomy directs the blood from the superficial veins to the deep veins. (Figure 14) shows the main veins in the calf and thigh: the common femoral, superficial femoral, popliteal, posterior and anterior tibial and peroneal veins are all part of the deep system. The main superficial veins are the long and short saphenous veins, and there are also the gastrocnemius and posterior thigh veins. The long and short saphenous veins join the deep veins at the sapheno-femoral and sapheno-popliteal junctions respectively. Perforators link the superficial and deep systems, and contain valves to allow flow only from superficial to deep. Normal venous anatomy is variable and becomes more so in disease when superficial veins enlarge and become varicose. Some of the variations seen on duplex scanning have been described by Somjen  . Figure 14: The main veins of the lower limb. The long and short saphenous veins are superficial veins and the remainder are deep veins. The main reason for scanning these veins is to detect veins in which the valves leak. The leakage may be due to valvular damage or to venous distension  . If the valves leak, the veins become incompetent and the blood falls back under gravity as the calf muscles relax, increasing the venous pressure because of the hydrostatic pressure of the column of blood being supported. The condition is known as venous insufficiency. Persistent increased pressure causes superficial veins to dilate producing varicosities, and causing tissue damage distally, showing first as changes in skin colour and progressing to ulceration. The main purpose of treatment is to reduce the excess venous pressure, and this can be done surgically or using bandages. Surgical treatment removes or ties the incompetent veins, and is suitable for superficial vein incompetence since there are other veins which can carry the venous return. The veins are tied at all points where the higher pressure blood from the deep veins enters the superficial system. This is usually at the sapheno-femoral junction or the sapheno-popliteal junction or through incompetent perforators linking the deep and superficial systems. However, the deep veins cannot be removed or tied since they are required to return the blood to the heart. If the deep veins are incompetent, the leg is bandaged to increase the external pressure so that the tissue pressure more closely matches the venous pressure  . The applied pressure is graded, being greater at the ankles and decreasing up the leg to encourage the venous return   . The clinical requirement is therefore to identify any superficial incompetent veins and to locate the points where blood is entering from the deep venous system. The presence or absence of deep vein incompetence must also be determined. If there are several incompetent vessels, it can also be useful to indicate which appear to be more significant. A simple examination can be performed using a hand-held continuous wave Doppler unit  but this only gives limited information and a full colour duplex scan is preferable. 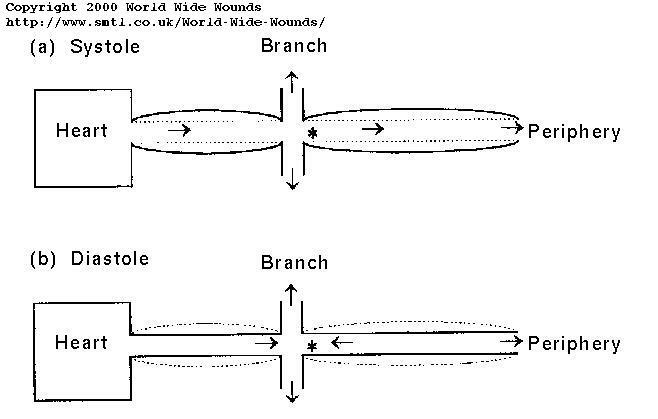 The duplex technique is described in detail by Polak . Patterns of venous reflux have been described by Myers et al  and Lees and Lambert  , and correlated with clinical symptoms and signs by Labropoulos et al  . Further validation of the duplex colour flow examination has been described by Pierik et al  . The examination starts with the patient standing facing the investigator, or lying supine on a couch tilted feet down at least 20� from the horizontal. This is to ensure the veins are filled, and also to ensure that gravity will return blood through any incompetent veins. Coupling gel is put on the probe, which is placed lightly on the skin in the groin over the femoral vein. A light probe pressure is essential, since too great a pressure can narrow or occlude the vein. 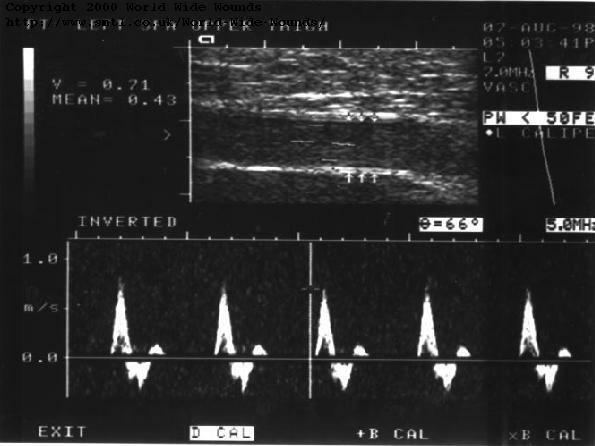 The femoral vein is identified using the colour Doppler display, and the probe moved along the vein until the site of the sapheno-femoral junction is located (Figure 15). This is near to the point where the femoral vein comes closest to the skin surface. The colour box is placed on the image of the femoral vein just distal to the junction and the thigh is squeezed gently. Flow should be seen in the vein, the colour indicating flow towards the abdomen. The squeeze is then released, and the image inspected for any reverse flow during the release. Any reverse flow persisting for more than one second is normally taken to indicate significant incompetence (ref 3, p 234), although some workers use 0.5 sec  or 0.6 sec  as the cut-off. The colour box is then placed over the image of the sapheno-femoral junction where the long saphenous vein meets the femoral vein, and the thigh again squeezed and released (Figure 16). Reverse flow persisting for more than 1 sec indicates significant long saphenous vein incompetence. Figure 16: A normal sapheno-femoral junction on squeeze/release. The blue in the long saphenous vein shows flow towards the heart. The blood velocity waveform shows flow towards the heart as the thigh is squeezed and the flow continues in the same direction as the squeeze is released. Although this procedure can seem straightforward, there are conditions which make the study difficult. The thigh can be difficult to squeeze, and in this case a co-operative patient can perform a Valsalva manoeuvre. The patient breathes in, closes their mouth and nose or throat, and increases the abdominal pressure by trying to force air out against the obstruction. The increased pressure is transmitted to the veins, and reverse flow is seen in the femoral or long saphenous veins if these are incompetent. Some patients may have recurrent incompetence which has developed since previous surgery. In these cases the long saphenous vein (LSV) may have been ligated and may not communicate directly with the femoral vein. However, small collateral veins may have opened, linking the femoral vein to the more distal LSV, or there may be incompetent perforators linking in the same way (Figure 17). The next part of the study is therefore to identify the long saphenous vein at mid-thigh level and to assess the degree of any incompetence in the same way as before. The probe is placed over the long saphenous vein on the antero-medial aspect of the thigh, posterior to the path of the superficial femoral artery. The calf is squeezed and released, and the presence and approximate duration of any reverse flow is noted (Figure 18). If an incompetent LSV is demonstrated, the vein should be traced proximally up the thigh to identify the source of the incompetence and in particular to look for the sites of incompetent perforators, which can be marked on the skin surface with a crayon. Figure 17: A large incompetent upper thigh perforator. The large perforator joins the deep superficial femoral vein (SFV) to the superficial long saphenous vein (LSV). On release of a thigh or calf squeeze, blood would flow from the deep vein through the incompetent perforator into the superficial system. Figure 18: An incompetent long saphenous vein. There is normal forward flow on squeezing the lower thigh (SQ), but the flow reverses when the squeeze is released (REL). The reverse flow persists for more than two seconds, indicating significant incompetence. The patient then turns round to face away from the investigator, and relaxes the leg being examined. The probe is placed behind the knee, the popliteal vein and the sapheno-popliteal junction identified and assessed for incompetence by squeezing and releasing the calf. If superficial incompetence is demonstrated, it is important to identify which vein is incompetent. This is usually the short saphenous vein (SSV), but may also be the posterior thigh vein or the gastrocnemius vein. Having assessed the main deep and superficial veins, it is important to examine any varicose veins to assess how they are being filled. They are usually filled by reverse flow in an incompetent superficial vein (LSV or SSV) but could be filled directly from incompetent perforators. The probe is placed lightly over the varicose vein, which is then traced up the leg using squeeze/release of the calf or thigh to augment flow and aid identification. Reverse flow on release of the squeeze can usually be seen clearly distally, but this may become harder as the probe is moved up the leg. This is because the varicose vein may be fed by small tortuous incompetent veins which pressurize the system but provide restriction to flow. In this case, squeezing the leg distally forces blood up the leg and this dilates the proximal vein providing a reservoir from which the blood falls back on release of the squeeze. However, more proximally the flow reduces because any reservoir is small or non-existent, and it can be impossible to trace the varicose veins satisfactorily. The veins are often tortuous with many branches and it is important to follow the main channel rather than side branches. The only guide is to try to follow the main incompetent vessel. At this stage of the examination, a clear picture has hopefully emerged, with the incompetent veins identified and a definite source of the incompetence demonstrated. It is very satisfying when this happens, particularly if the picture is complicated. However, there are times when a satisfactory picture does not emerge, and the report has to reflect this. The final part of the study is to identify any further incompetent perforators, particularly in the calf. It can be difficult to examine the calf with the patient standing on the floor, so some operators stand patients on a stool. Patients do occasionally become faint and very occasionally collapse without warning, so I prefer to examine the calf with the patient sitting up on a couch with the knee bent so that the calf is about midway between horizontal and vertical. The medial, lateral and posterior aspects of the calf are then scanned in longitudinal mode using the colour Doppler display. Incompetent veins can be identified close to the ankle using squeeze/release of the distal calf, and any incompetent veins tracked up to establish any communication with the deep veins. Sites where blood enters the superficial system on release of the squeeze are marked, and the distances from the lateral or medial malleolus are measured and recorded. Venous examinations, particularly for recurrent incompetence, can be complex and time-consuming. I generally allow 1 hour for a bilateral scan, and 40 minutes for a unilateral study. More time is required if bandages have to be removed before the study. It is important to make notes of the findings at each stage of the study, and a sketch can sometimes be useful as an aide memoire. The deep veins in the leg return blood to the heart with the help of the muscle pump and the valves in the veins. Thrombus can form in these veins, and this is potentially dangerous because the thrombus can become dislodged, travel through the vena cava and the right side of the heart and lodge in the pulmonary artery causing a pulmonary embolus, which can be fatal. 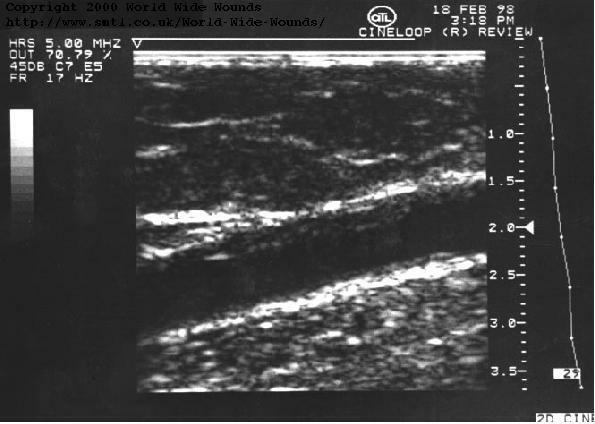 The usual method to detect deep vein thrombosis is with venography, but colour duplex scanning can now provide a quick and non-invasive alternative method of diagnosing deep vein thrombosis in the veins above the calf    . The procedure determines whether the veins are patent and whether they can be compressed with pressure from the probe. The patient lies supine on the examination couch with the feet tilted down at about 15 or 20�. This ensures the veins are filled with blood and can be identified. The examination starts in the groin. Transverse scanning is usually employed, and the probe is placed over the femoral vein. The patency of the vein is assessed from the colour display, but no augmentation of the flow is used because this could dislodge any thrombus that might be present. The probe is then pressed into the skin and compression of the vein is usually seen. It should be possible to completely compress the vein at the groin since it is near the surface. Any residual non-compressible lumen is likely to be filled with clot, and a careful examination of the region of flow on the transverse scan can help to confirm this. (Figure 19) shows a vein containing thrombus, and (Figure 20) shows the same vein failing to compress when probe pressure is applied. Figure 19: Superficial femoral vein with thrombus. The thrombus can be seen as brighter echoes within the lumen of the vein and attached to the upper (anterior) wall. Figure 20: Incompressible vein indicating thrombus. The vein (SFV) is not compressed when probe pressure is applied. This suggests a deep vein thrombosis which is confirmed when the vein is imaged longitudinally (Figure 19). As soon as thrombus, either occluding or non-occluding, is detected, the examination is ended. If the vein appears normal in the groin, the probe is moved down the thigh keeping the image of the vein in the centre of the screen. Every few centimetres, pressure is applied on the probe until the vein compresses completely. This is done as far down the leg as possible. More pressure must be applied as the vein becomes deeper, and if the limb is swollen it may not be possible to assess the vein satisfactorily in the distal thigh. The patient then lies on their side or front or sits with their legs dangling over the side of the couch, and the popliteal vein is assessed in the same way. In the calf, there are three sets of deep veins, the anterior tibial, posterior tibial and peroneal. With state-of-the-art equipment and an experienced examiner, it is possible to assess these calf veins, although there is debate about the accuracy of the technique in these small vessels. Examination of the calf veins also extends the time of an examination which takes about 15 minutes for one limb and about 25 minutes for a bilateral study. Ultrasonic scanning is now established as a valuable non-invasive method for investigating lower-limb vascular disease. It is the first method of choice for arterial stenosis and occlusion, and for venous incompetence. It is also being used more extensively for the initial investigation of deep vein thrombosis. The technique does however require considerable operator expertise and is often restricted by technical limitations, particularly on older equipment. This article has outlined the procedures for the basic tests and has described the limitations. It is hoped that this will lead to a deeper understanding of the strengths and limitations of the techniques and will contribute to the continual development of ultrasonic vascular diagnosis. I am grateful to the Medical Photography Department at Bournemouth Hospital for preparing prints. 1 - Meire HB, Farrant P. Basic Ultrasound. Chichester: Wiley, 1995: 1�7. 2 - Androulakis AE, Giannoukas AD, Labropoulos N, Katsamouris A, Nicolaides AN. The impact of duplex scanning on vascular practice. International Angiology 1996; 15: 283�290. 3 - Polak JF. 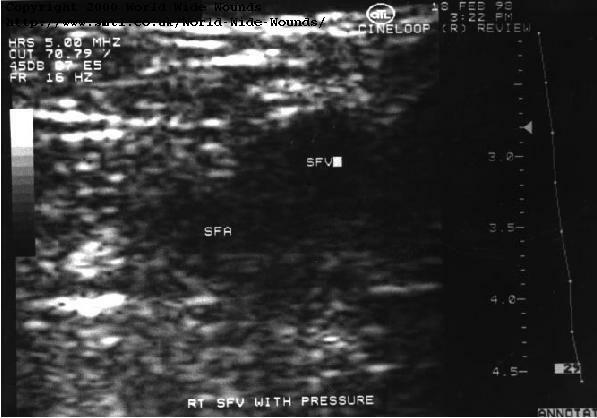 Peripheral Vascular Sonography: A Practical Guide. Baltimore: Williams and Wilkins, 1992. 4 - Polak JF. Peripheral arterial disease: evaluation with color flow and duplex sonography. Radiologic Clinics of North America 1995; 33: 71�90. 5 - Santilli JD, Rodnick JE, Santilli SM. Claudication: diagnosis and treatment. American Family Physician 1996; 53: 1245�1253. 6 - Edwards JM, Coldwell DM, Goldman ML, Strandness DE. The role of duplex scanning in the selection of patients for transluminal angioplasty. Journal of Vascular Surgery 1991; 13: 69�74. 7 - Jager KA, Phillips DJ, Martin RL, Hanson C, Roederer GO, Langlois YE, et al. Noninvasive mapping of lower limb arterial lesions. 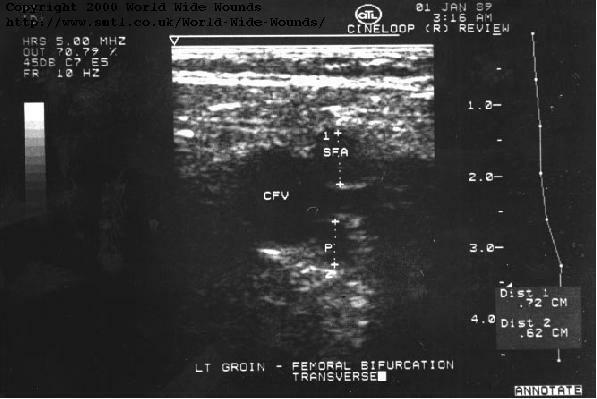 Ultrasound in Medicine and Biology 1985; 11: 515�521. 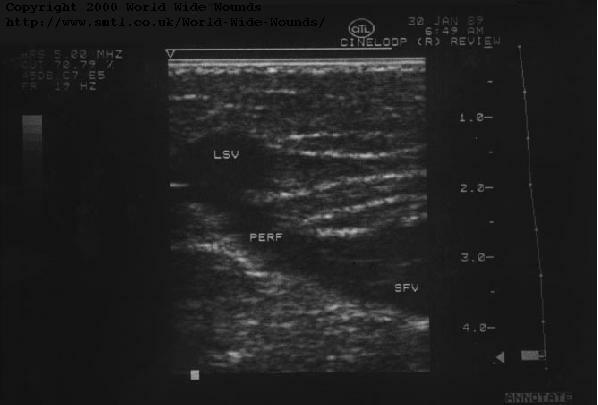 8 - Hislop C. Leg ulcer assessment by Doppler ultrasound. Nursing Standard 1997; 11(43): 49�56. 9 - Stubbings N. Using non-invasive methods to perform vascular assessment. Nursing Standard 1996; 10(45): 49�50. 10 - Williams IM, Picton AJ, McCollum CM. 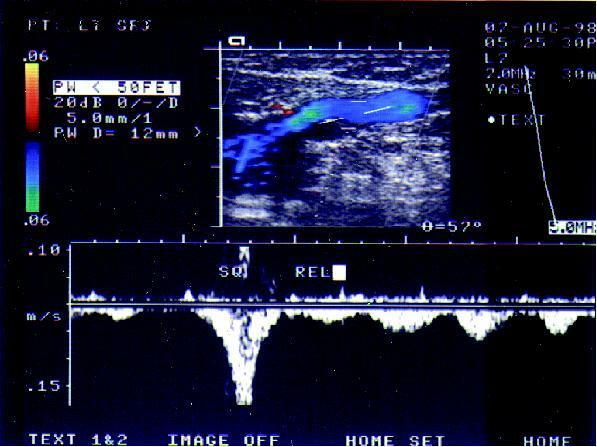 The use of Doppler ultrasound 1. Arterial disease. 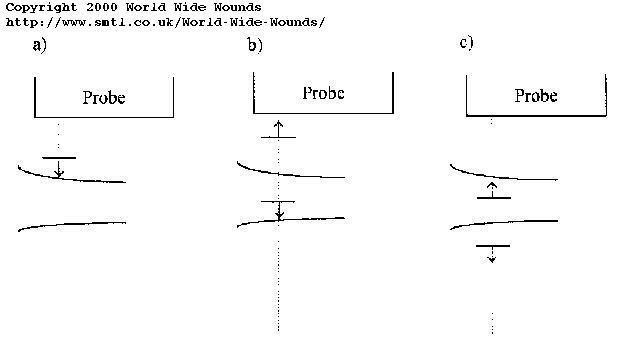 Wound Management 1993; 4: 9�12. 11 - Maxwell MH, Waks AU, Schroth PC, Karam M, Dornfeld LP. Error in blood-pressure measurement due to incorrect cuff size in obese patients. Lancet 1982; ii: 33�36. 12 - Currie IC, Jones AJ, Wakeley CJ, Tennant WG, Wilson YG, Baird RN, et al. Non-invasive aortoiliac assessment. European Journal of Vascular and Endovascular Surgery 1995; 9: 24�28. 13 - Somjen GM. Anatomy of the superficial venous system. Dermatological Surgery 1995; 21: 35�45. 14 - Vanhoutte PM, Corcaud S, de Montrion C. Venous disease: from pathophysiology to quality of life. Angiology 1997; 48: 559�567. 15 - Turner-Boutle M, Fletcher A, Sheldon T, Cullum N. Compression therapy for venous ulcers: a systematic review. Nursing Times 1997; 93(39): 52�53. 16 - Moody M. Intermittent sequential compression therapy in lower limb disorders. Professional Nurse 1997; 12: 423�425. 17 - Moffatt CJ, Oldroyd MI. A pioneering service to the community: the Riverside community leg ulcer project. Professional Nurse 1994; 9: 486�497. 18 - Picton AJ, Williams IM, McCollum CN. The use of Doppler ultrasound 2. Venous disease. Wound Management 1993; 4: 13�15. 20 - Lees TA, Lambert D. Patterns of venous reflux in limbs with skin changes associated with chronic venous insufficiency. British Journal of Surgery 1993; 80: 725�728. 21 - Labropoulos N, Leon M, Nicolaides AN, Giannoukas AD, Volteas N, Chan P. Superficial venous insufficiency: correlation of anatomic extent of reflux with clinical symptoms and signs. Journal of Vascular Surgery 1994; 20: 953�958. 22 - Pierik EG, Toonder IM, van Urk H, Wittens CH. 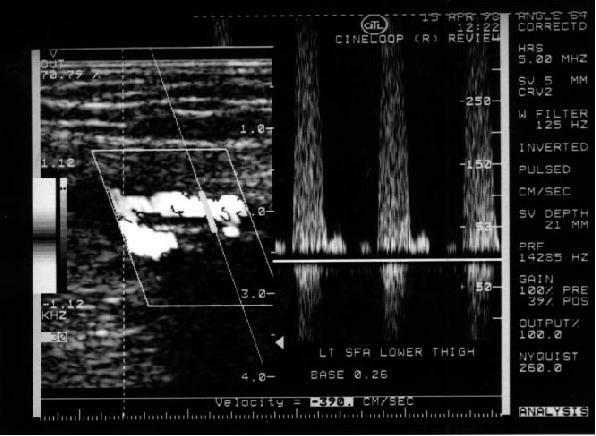 Validation of duplex ultrasonography in detecting competent and incompetent perforating veins in patients with venous ulceration of the lower leg. Journal of Vascular Surgery 1997; 26: 49�52. 23 - Baxter GM. The role of ultrasound in deep venous thrombosis [Editorial]. Clinical Radiology 1997; 52: 1�3. 24 - Dauzat M, Laroche J-P, Deklunder G, Ayoub J, Quere I, Lopez F-M, et al. 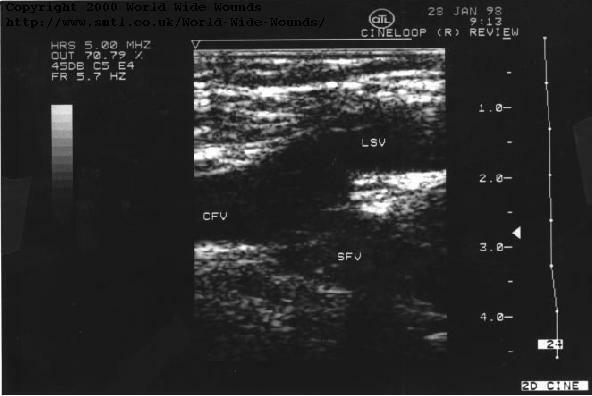 Diagnosis of acute lower limb deep venous thrombosis with ultrasound: trends and controversies. Journal of Clinical Ultrasound 1997; 25: 343�358. 25 - Labropoulos N, Leon M, Kalodiki E, Al Kutoubi A, Chan P, Nicolaides AN. Colour flow duplex scanning in suspected acute deep vein thrombosis; experience with routine use. European Journal of Vascular and Endovascular Surgery 1995; 9: 49�52. This article was originally published in the Journal of Tissue Viability 1999, Vol 9, No 2, pages 45-55. The copyright of this article remains with the Tissue Viability Society.